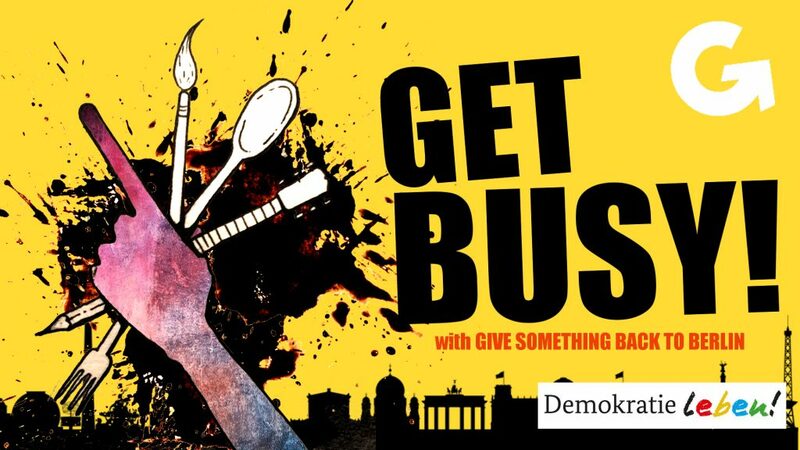 Give Something Back To Berlin » GET BUSY in Berlin! Berlin (and the whole world, let’s get real) can be a messy place. It can be unfriendly and cold, too slow, too fast, too, shallow, too deep, too little, too much. It can leave you feeling frustrated and a little lost. But sometimes it’s also a fabulous place, where people come to work on their dreams, learn, explore, connect with like-minded individuals, re-build their lives, create mini utopias and think about what could be done differently – in their life and in the whole world. On this evening we’ll focus on the second part: ways to engage in meaningful activities to build positive vibes and tribes in a messy little world. How to connect not only with your FB-feed but IRL with people in your neighbourhood. You will get info on how to involved with some of GSBTB’s (more than) 20 weekly activities such as Open Art Shelter, Open Kitchen, Open Music School, German and English language cafe, how to volunteer and how to participate. Maybe you want to learn how to play piano or produce electronic music? Support refugee newcomers in establishing themselves or pass on a skill you learned from back home? Or maybe you want to share that famous recipe from your hometown with others or cook for homeless people? Or do you have your own ideas for doing something constructive in your community? Come and pitch your ideas and projects. Find like-minded people to start building on your own idea.